Mr. Benedict has planned a surprise for his four young friends: a treasure hunt of sorts that will reunite them and challenge them while providing a wonderful adventure. Unfortunately, the plans are derailed when his evil twin Mr. Curtain returns. 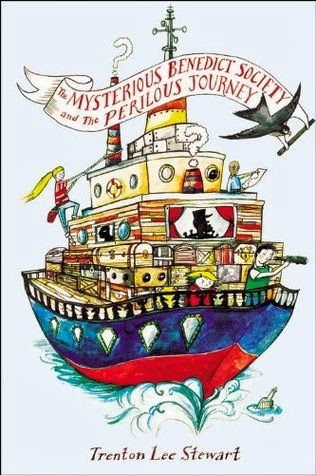 As delightfully quirky as the first book in the series, The Mysterious Benedict Society and the Perilous Journey gives each of these four markedly different children the opportunity to develop and showcase their talents and abilities. They set off on this journey without any adult assistance, though several come to their aid during the course of events. The children have to rely on each other, and yes, they occasionally argue and get on each other's nerves, too, but at the end of the day, they know they can depend on their teammates. Constance in particular is learning more about what she is capable of and integrating into the team more fully, though some of her new abilities are a bit beyond the realm of belief. Not all goes smoothly, of course. There are new dangers and frightening enemies, but an overall sense of optimism permeates the book as it does Mr. Benedict's approach to life. There is much more to the world than most children --indeed, most adults -- ever see or know. And where most people see mirrors, you, my friend, see windows. By which I mean there is always something beyond the glass. You have seen it and will always see it now, though others may not...Have you considered the possibility, Reynie, that wickedness is simply more noticeable than goodness? That wickedness stands out, as it were? He also warns the children to keep an eye out for the "great many sheep in wolves' clothing," a reminder that not everyone who appears evil is truly bad at heart. I like the unique characters and the way the four children interact, demonstrating that all gifts are valuable in some circumstances. Puzzling out the clues side-by-side with the characters is fun and engaging, and I appreciate the optimistic tone of the book; even when all seems lost, Mr. Benedict remains calm and confident that right will prevail. And it does. At the same time, there's something missing. The books are enjoyable diversions, but I'm not so hooked in that I can't put them down. There are occasionally awfully convenient plot twists that seem to come out of nowhere. They're not favorites, but I have a good time while I'm reading them.